We’ve been reviewing the Galaxy Nexus and we’ve found battery life to be quite decent for an Android device. However, if you want to squeeze every last minute possible out of your new favorite gadget, then Verizon is offering an extended battery for the LTE version of the smartphone. 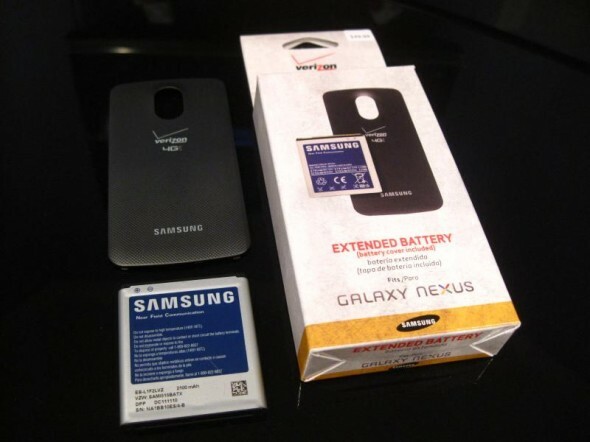 The Verizon-bound 4G LTE Galaxy Nexus comes with a 1,850mAh battery as standard but for $49.99 you can get the 2,100mAh extended battery, which you see above. That’s only a 13.5% increase in capacity but that could mean the difference between getting through a whole day with one charge or not, depending on your usage. During our tests with the GSM HSPA+ Galaxy Nexus, we could consistently get by for around 15 hours and 30 minutes until battery went below 15%, and that was with the screen on for 2h 30m, not bad at all. A 13.5% increase in capacity could mean around 2 more hours of usage. The GSM Galaxy Nexus only comes with a 1,750mAh battery as standard but the LTE version, because of its radio, presumably consumes more battery. The Verizon Galaxy Nexus battery kit comes with a separate back cover which we would assume makes the LTE Galaxy Nexus slightly thicker. Bear in mind that the LTE Galaxy Nexus is already 0.54mm thicker than its GSM counterpart. We aren’t sure if this kit will fit the GSM version, but we sure hope that a similar extended battery appears soon to power our ever-growing love for the Nexus. Previous story Apple has its own internal iOS codenames, Hoodoo anyone?